What do you do when one of your peers at work does something cool, helpful, beneficial or just helps someone out? If you’re like most employees in most workplaces, you’ll probably say thanks if it impacted you directly and you were there at the time, but what about situations where you’re not there, or where it wasn’t directly for you but it was just useful or beneficial to the team/group/company? Quite often it’s the cool things, the beneficial things or the times when someone just does something to better the team that you might not always remember to say thanks or even acknowledge that you noticed it. This isn’t a reflection on you, it’s more than likely a reflection of how busy you are, or how engrossed you are in the work you’re currently doing. 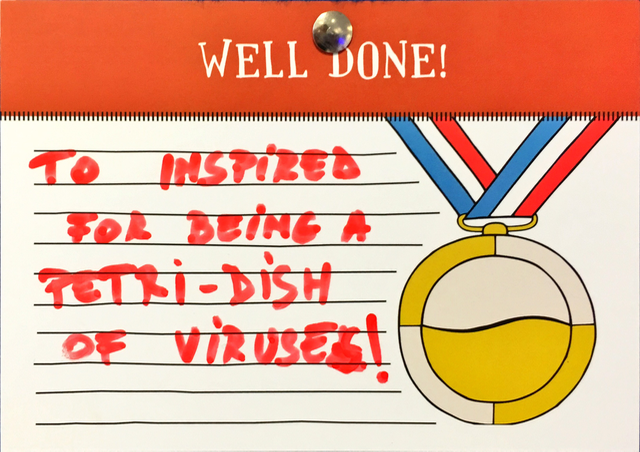 To make the act of peer appreciation visible and more engrained into my team’s ethos, I recently put up a Kudos wall in our kitchen (which is probably the most common area people go to, except the toilets!). So far so good, after a month it’s looking pretty busy, and it looks bloody great up on the wall! One of the most interesting things I noticed is that more than half of the cards are from people outside my team. Now it’s not a surprise since my team makes up about 40% of the office, but it was great to see people start putting up cards without any prompting what-so-ever. There’s no rules as to what, why, when and to who someone can give kudos to. The wall has a stack of empty cards just waiting to be used, and all my teams have a bunch of cards if they need them. One of the ideas I try to instil though is that Kudo should ideally go sideways, or up, rather than down, the company hierarchy. This is mainly to solidify the concept of peer recognition rather than a method of rewarding those people someone is responsible for. Recognition from your boss is all good and well, and maybe it’ll give you hope that your next appraisal (you still do those?!) will go well, but most people thrive off recognition of those they work side by side with every day. Obviously Kudo walls are great if people know they’re being recognised on there. While I see people reading the wall almost every time I go in the kitchen you’re not guaranteed that someone being recognised on there will actually see it. While the company on the whole will see benefit from the feeling that people are appreciated and doing great work, it’s important that the recipient sees the gratitude to. Initially I contemplated removing the cards from the wall and handing them out to the recipient, but I didn’t want to strip content from the wall. It wouldn’t give the right message if all the Kudo was going up and then coming back down. Besides, a full wall looks so much more powerful if it has a lot of Kudo on there! Instead, every Monday I simply take a photo of each card and email it to the recipient (CC’ing the sender) so people know they’ve been appreciated. Any longer than a week and the impact of saying thank you starts to lose its power (the nearer to the event the more of an impact the card will have). I could so it more regularly, but the start of the week has a good cadence to it. Of course not everyone is going to jump at the chance to get involved. I have heard comments such as “I’m not interested in getting some hollow pat on the back”, “Do you think I’m a dog and need a little treat when I do something well?”, and “<sarcasm>Greeeeeeeat</sarcasm>”. To be honest, even I was a little sceptical when I first started looking at how we could embrance peer recognition throughout the studio. But the only type of comments that really need discussion are the ones regarding ‘hollow thanks’ and ‘little treats’. Most other comments can be left to the doubters, assuming that as the wall becomes more popular, their less than enthusiastic comments start to be seen as a minority. These ‘treat’ and ‘hollow thanks’ comments are exactly why I stress that the recognition should go sideways, or up, and hardly ever downwards. As we’re recognising behaviour (and not always outcomes) recognition down cannot help but be seen as an “I approve” statement in a lot of places (especially depending on the relationship between the employee and employer). By focusing the recognition on peer-to-peer relationships, you move away from the reward concept to one of appreciation and recognition. Everyone likes to feel as though they are helping out their friends and their collegues, often the people they see more often than their family! One thing I have decided to do, though it’s not happened yet, is to reward those appreciated over time. Keeping track of who is getting Kudo, and who is giving it, allows me to provide a bit of added appreciation over time. So when someone receives [x] Kudo cards, they have the opportunity to do something for their team. It might be an extended and paid for lunch, a trip to the cinema or pizzas brought in for lunch, it’s up to them. The initial thought here was to reward the recipient only, but that starts to focus the appreciation on a single person. It is possible that someone get’s a lot of Kudo, and some people, for what ever reason, get none. By focusing the extended appreciation on the team rather than the individual, it shows that that whole team, or the whole company, benefits from doing great work and recognising it, rather than the focus always falling on the same people time and time again. Now, no-one on the team actually knows this is my plan (well, some of them do) so it should come as a nice surprise when someone hits that magic [x] mark. Not sure what the [x] mark is yet though, I’ll know when I get there. 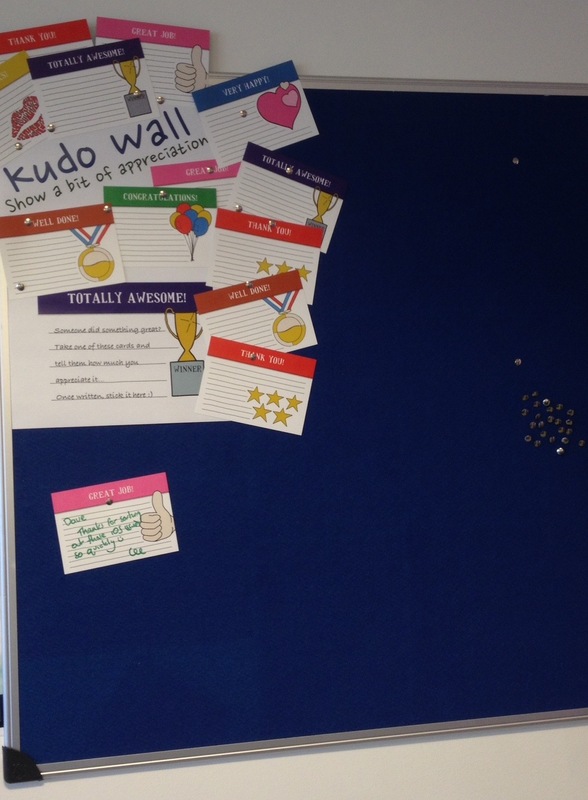 The Kudo wall works well for teams that are co-located. 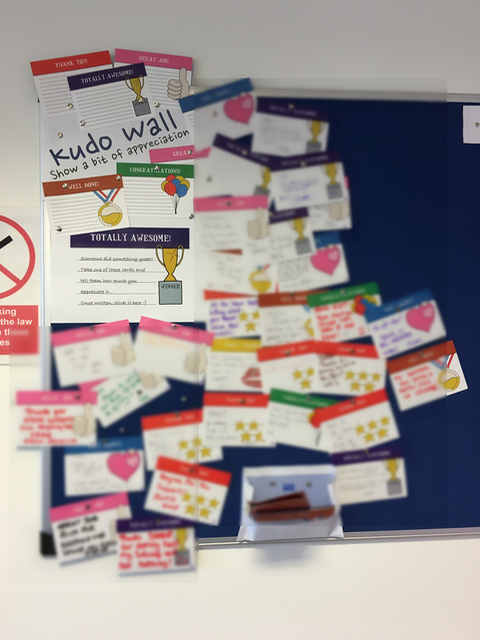 It’s pretty difficult to set up a Kudo wall (or equivalent) if everyone on your team is spread out across the globe, or even if one or two of your team are just in another building. There are plenty of ways that you can provide instant peer-to-peer recognition using online services, of which Bonusly is probably the most well know (even if you don’t use them, I’d recommend subscribing to their blog). But there are plenty of others like ThanksBox and DueProps. I’ll continue to update on the progress of the Kudo wall over the next few months to see how this experiement continues to unfold.